Guitarist and USC Thornton alumnus John Storie (BM ’06, Studio Guitar) is featured on the forthcoming album, Jeff Goldblum and the Mildred Snitzer Orchestra, which will be released November 9th. The 14-track album by the well-known actor and part-time jazz pianist Goldblum, includes appearances by Haley Reinhart, Till Bronner, Imelda May, and comedian Sarah Silverman. 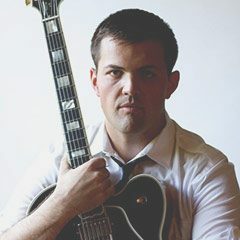 Storie is a founding member of the New West Guitar Group and was selected as a semi-finalist in the Thelonious Monk International Jazz Guitar Competition. He has played with Goldblum’s Mildred Snitzer Orchestra since 2012.